The CL Series case loader. SWF Companies' CL Series modular case loader is designed to convey, position, accumulate and load various packages into corrugated shipping cases at speeds up to 30 cases a minute. Available in automatic and semi-automatic configurations, the CL models will case-pack virtually any product that is packaged in a rigid or semi-rigid container. 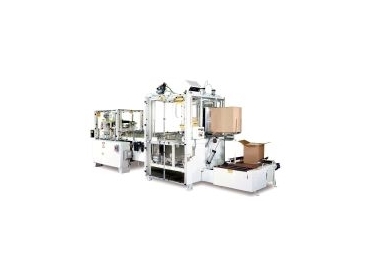 Typically integrated with one of SWF's case opener/sealer models (to form a fully automatic case packing system), applications for the CL Series include paper products, cereal, baked goods, detergents, cosmetics, pharmaceuticals, confectionery products, general food products and a host of other items. Typically customised to fit a specific application, standard features on all CL models include Allen Bradley controls, rugged construction, modular design, quick changeover features and full operator safety guarding, among a host of other items. Often incorporating multiple infeed lane designs, the CL models feature a variety of optional product handling devices, including converging, diverging, accumulating and positioning systems. Other options include servo-controlled operation, touch screen operator interface, centralised grease blocks or lubrication systems, automatic insert feeders for corrugated dividers and PLC controls for easy trouble shooting and line communications.